a book from the outside in, The Life of Spinola! Polybiblion: Revue Bibliographique Universelle, Volume 76 – states (in French) that Docteur Bouland publishes a brochure adorned with beautiful engravings: The Foundation of Father Joachim Faucher and Vex-libris of PP. Jesuits of Avignon (Macon, imp. Protat, gr. in-8 4 p. Extract of the journal French Society of bookplate collectors). The author provides information on Fr. Joachim Faucher, born in Bollène February 12, 1606, died at Shore deGênes April 24, 1650, and the donation that he made in 1639 to the Jesuits of Avignon , using an inheritance given by his father, for a sum of three thousand pounds, whose interests were intended to sustain their library. 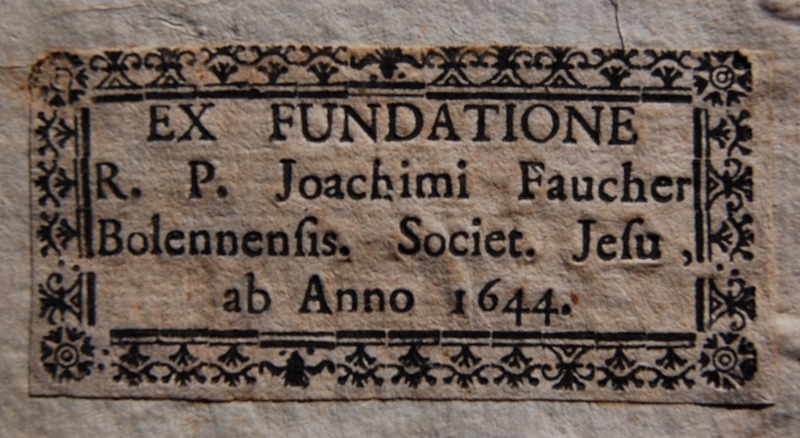 For one hundred twenty-five years, from 1644-1768, all the books purchased by the Jesuit house Avignon were affixed with the commemorative book plate which is on this book: Ex fundatione RP Joachimi Bolennensis Faucher, Societ. lesu ab anno 1644. So maybe this book wasn’t at Avignon as I might like to think, but there is more! To me we can place the book at Aven..at 1688.. But that is 60 years after the book was published? up on close inspection, it looks as if a previous owners name has been trimmed off the top of the title and at the bottom too, or at least covered on the bottom .. 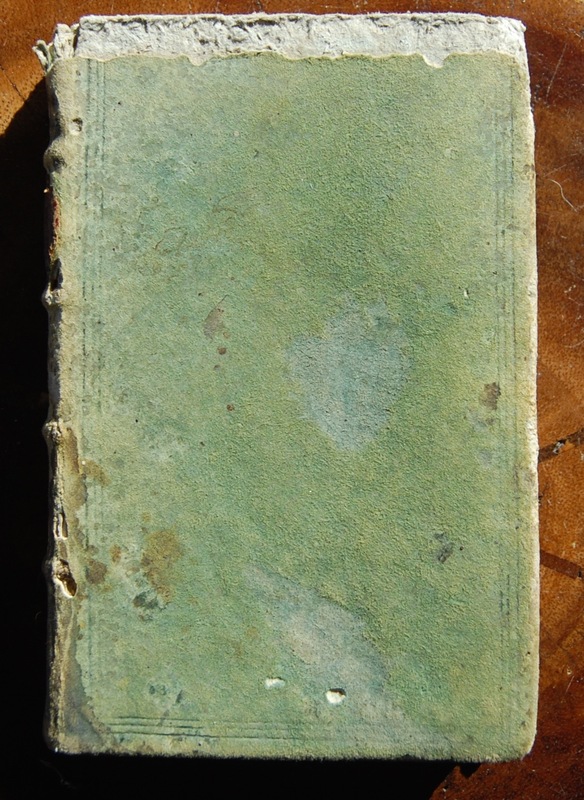 The binding is early and c ertainly seventeenth century, a very nice but worn and chewed revers alum tawed skin dyed green! so probably the first owner is lost to time . Vita del P. Carlo Spinola della Compagnia di Giesù morto per la santa fede nel Giappone : del P. Fabio Ambrosio Spinola dell’istessa compagnia. 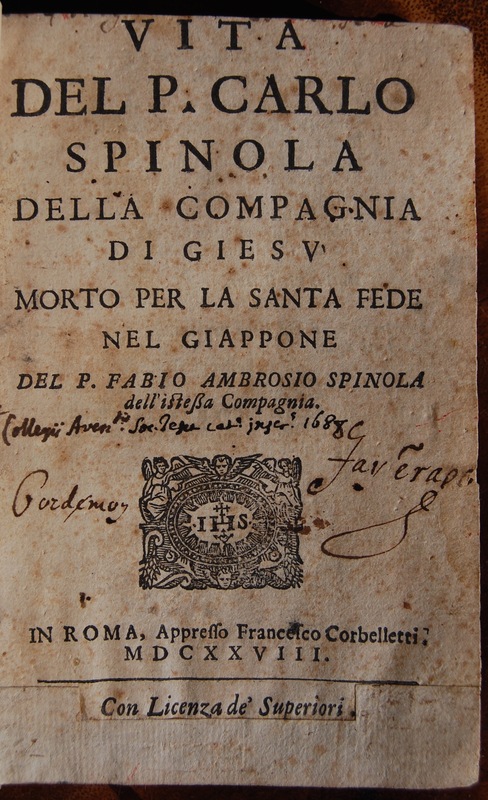 This is a First edition of the Biography Of Carlo Spinola which was written six years after his death by his cousin Fabio Ambrosi Spinola, 1593-1671.
l state of morality among the Spanish sugar plantations deplorable, and Spinola considered their arrival providential. Based in San Juan, he and the small band of Jesuits preached and taught catechism, visiting outlying settlements. On one occasion, Spinola was nearly drowned when his horse lost its footing crossing a river. Setting sail from Puerto Rico on 21 August 1597, Spinola’s ship was captured by English pirates off the Azores and the Jesuits arrived in Yarmouth on 5 November. He studied Japanese before going to Miyako (Kyoto) where he was minister at the Jesuit College, and a teacher of mathematics and astronomy. For twelve years, he worked at ministering to the growing Christian community in Japan. In 1614, all foreign missionaries were banished so Spinola went into hiding, eluding capture for four years. After being arrested in 1618, he, together with Brother Ambrose Fernandes and their catechist, John Chogoku, were imprisoned for four years in a birdcage-like confinement under harsh conditions. He was burnt at the stake at Nagasaki on 10 September 1622. Charles was declared Blessed in 1867, along with 30 other Jesuits, over half of whom were Japanese. see Bl. Charles Spinola”, jesuit.org.sg; accessed 1 March 2014. “In Sep 1622 the nine prisoners were taken to Nagasaki and felt martyrdom would soon be theirs. Before they left, Fr Spinola accepted the vows of his seven novices. On Sep 9, the nine Jesuits together with twenty-four other prisoners at Suzuta, each with a rope round his neck, and the Jesuits in their cassocks were led to Martyrs’ Hill escorted by 400 soldiers. There they waited for another thirty-three prisoners from the city. When the 2 groups met, they embraced. Fr Spinola recognized Isabel Fernandez among them, the wife of Dominic Jorjes, his host, and her four-year-old son Ignatius. The religious, with exception of John Chugoku were condemned to death by slow fire, the Christians and Chugoku were to be beheaded. When fastened to his stake, Fr Spinola intoned the psalm, Praise the Lord, All You Nations, and the martyrs joined in a song of thanksgiving to God. The fires were lit but the wood was so arranged to prolong the victims’ suffering. Fr Spinola died within half an hour belonged he was greatly weakened after four years of imprisonment. Fr Kimura, endured his martyrdom for three hours and was the last to die, during which time he remained immobile with his arks outstretched in the form of a cross.